Well Val, that didn't take long. The vexatious blogger [and his uk based poodle], made his regular pilgrimage to the site and yet again manages to use, abuse and twist the sentiment of the writing to suit his own personal agenda. 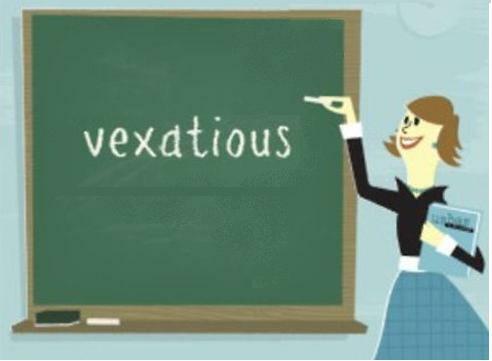 Vexatious blogger indeed. Now, I give a link to the original text and its context in the thread, anyone can check for themselves (until the tekkies hide the thread or delete the posts) whether what I said they said has "abused the sentiment", or "twisted the sentiment" of what was said to suit my "own personal agenda". I quote what was said, I say what I think of what was said. "Handyman", its what we call comment and expressing an opinion, or debate. Metal detectorists (and the PAS) may find it "vexatious" that not everybody is a passively silent PAS yes-man when it comes to artefact hunting and collecting. I think artefact hunting are damaging. I think, after many years close observation, that a lot of you who are doing it are not at all what you make yourselves out to be (and what BM/PAS press releases depict you all to be). I'll be damned if I'll sit by and not try to do anything about it, like most of my jobsworth (British) colleagues. I take it this rally has been cancelled because of outside interference. I did start a thread after the Acorn rally was cancelled warning everyone that this is going to start happening more often. Think the thread only had around 6 people commenting on the subject. I think rallies advertised on metal detector forums should only be able to be viewed by members of the forum Otherwise its going to keep happening over and over again. How would the said blogger even know which farm it was in Somerset lots of farms. Odds of getting the right one must million to one. Surely. Surely, somebody knew where that rally was taking place. Vignette: Daniella Pettite of the PAS teaches the looters a new word. As America readies itself for a 'punitive' strike on Syria, this is quite a good read: A beginner’s guide to the conflict in (and country of) Syria. The April 2013 report by Olly Lambert is thought-provoking (the section titled "Why am I only just hearing about all this?" is also too - but in an entirely different way). Although US metal detecting agitators may attempt to claim that there is no evidence that metal detecting has been taking place on sensitive and legally protected sites along the Oregon Trail, there would be nothing at all surprising in this. Artefact hunting is demonstrably going on in the immediate vicinity, and quite openly. For example there is the "Oregon Treasure Trails Society" ("uniting individuals who share a common interest in the sport and pastime of using metal detectors to search for coins, jewelry and relics from the past"). Then on a metal detecting forum near you (one of the members of which is the same metal detectorist denying the connection between holes in the Oregon Trail and metal detecting) we can read about "A strong box recovered on the Oregon Trail". It was being sold by Ira & Larry Goldberg Coins and Collectibles, Inc. ("our consignor was poking around in the area around Twin Falls, Idaho, near a known stage coach stop along the Oregon Trail with a metal detector..."). Someone asks "Has Anyone Tried MDing Emigrant Trails? ", and receives the answer "Many people, including myself have been detecting along these old trails for years and years. research is key. good luck!" The point about "research" of course is to locate specific sites along the route that might contain a concentration of collectable artefacts due to the nature of the activities taking place there. in other words, these artefact hunters are targeting known historical sites to remove from them the material evidence of past activity (in other words looting its archaeological record in the search for collectables for personal entertainment and profit). An example of this is the thread on an "emigrant camp site off the Oregon trail". A mixed up accumulation of decontextualised collectables from a number of different sites on the Oregon Trail can be seen here: "Oregon Trail Finds from the last few years" showing the sort of things being removed from the historical record by artefact hunters in the US targeting known historical sites. Just do it. It isn't a big deal. If you ask somebody, you might get told NO.. even if that's wrong. Just go and enjoy the BLM lands. I've spent a huge portion of my life, prospecting and metal detecting on BLM. Have NEVER had anybody ask me what i was doing. the best places to detect along the trail, would not simply be to find where the trail went, and start checking alongside of it. Instead, the best places, are where they STOPPED. Ie. : camped for the night, especially if there were some sort of commercial venture going on there (trading post, saloon, stage stop, etc....). So, basically anywhere where there is any archaeological evidence of past activity you mean? Thanks everyone for the responses. I think I'm going to hit up a area tomorrow that thru research is a old campsite. Stop. You need to learn the laws of not only Idaho, but the rest of the country as well. It is a federal offense to collect artifacts from the Oregon Trail or any other historic resource of the country. The penalties are stiff. Not just in Idaho, but everywhere. It is also against the law to collect historic artifacts on BLM or other federally owned land. This includes Indian artifacts such as arrowheads, etc., as well as Oregon Trail artifacts. The emigrant trails are a great resource. Please don't destroy them by digging for artifacts on them. Somebody just did that on a stretch by Burley and destroyed a pristine section of trail. Learn the history of the trails, read the diaries of the travellers, hike on them and share the struggles that thousands of emigrants went through. But please don't dig them up and steal artifacts for your personal collection. Ironically (see above) "Jim in Idaho likes this". This is followed by a couple of "cold-dead hands"- type arguments applied to archaeologists "telling us what to do" of the sort that you'd find among any group of anti-preservationist artefact hunters. Maybe it was rouge archaeologists that were tired of waiting for Henrikson and real archaeologists to dig up the artifacts so they could be put in a box and stored in a warehouse belonging to a museum with the millions of other items that no one will ever see. [...] Or maybe it was gophers! He or she gets 'robotic aliens' in there too. In the UK they are told that illicit and irresponsible artefact hunting (so-called "nighthawking") is almost a thing of the past and that it's all thanks to the PAS and its fostering a jolly nice friendly "partnership" between jolly nice archaeologists and jolly nice artefact hunters. So what a shock it must be for the archaeologist to find out they are not all "jolly nice", eh? Does Rob Hedge ‏@robhedge in this tweet sound as if he's seeing this for the first time? Below are the pictures he took. I expect the stout "Defenders of the Basically Indefensible" will try to question the "assumption" that it was metal detectorists that did this and not gophers. Somehow though I think they are fighting a losing battle. and Worcestershire Archive and Archaeology Service). "Don't want to tar all detectorists with the same brush, but this opportunistic looting of sites is damaging and very frustrating." Sounds like he's not really going to paint any kind of picture at all then, but at least he called it "looting". Focus on UK Metal Detecting: Keep it Quiet, They're On To Us. back and wait and see." I think theres more to thes cancellations that meet the eyes. Several rallies over the last few weeks have been cancelled. Are there some people working against us? Friend of mine in Essex has had a permission on a farm for the last 10 years only to be told last week they dont want any detectorists any more. Should we keep rallies a bit more secret in future, closed list? I.E. IF THEY DON'T KNOW ABOUT IT THEN THEY DON'T KNOW WHEN IT'S DAMIGING SO THEY CAN'T TELL THE BLOKE. So just sort of sneak furtively up on it and "damige" it a bit (lot) and then scarper before the "bloke" gets told by the arkies that he's let a load of 'eritidg damiging oiks knacker the buried history of his land? A cunning plan indeed. Not very public-spirited though is it, keeping "the Bloke' in the dark. Still that's what their official "partners" tend to do a lot of these days too. 140 acres of pasture in prime Roman/ Medieval settings.[...] We will also be inviting an FLO for id'ing finds.[...] The location of the rally will be sent by private message to everyone who has signed up the day before the rally. So it looks like it was being kept a secret anyway. Just so preservationists don't "tell the Bloke"? But it seems possible that somebody did... If so, good for them. While prior observation suggests there's not much chance of that, it'd be nice if it was the PAS guy or gal. That is after all what their job should entail, advising the public impartially on portable antiquity issues, and no IfA card-holding archaeologist would be condoning (can condone) a commercial artefact hunting rally, PAS recording or no PAS recording. If "Goldpanner" does not understand what the problem is with commercial rallies, then he or she can always ask their local PAS officer, can't they? I'd love to be a fly on the wall with a Dictaphone when that one is answered. "Are there people working against us?" asks the hapless newbie. Well, there are a few, yes, but not nearly enough. 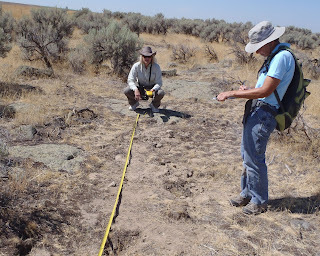 Metal detectorists over on an archaeology-hating blog are questioning whether it was hobbyist artefact hunters who dug holes all over a section of the Oregon Trail (see here and Cf here - my version here). The detectorists, wholly true to usual form, instead of expressing concern about destruction of the historical record suggest that they - collectively - are the victims of some dastardly anti-collecting conspiracy. So, in this context I was was interested to see another video on a similar topic from a little further west, where it is perfectly clear what is happening and who is involved ("Metal Detecting Oregon - Barlow Trail Explorations", posted on You Tube by "metaldetectingoregon" on 14 Nov 2011). I really do not see how anyone normal could try to claim with a straight face that this sort of thing is not happening. More attempts to spread misinformation by artefact huntyers and collectors. mikejohns777 10 months ago: I remember the old days﻿ when we would dig up shallow graves and would be able to take the skulls along with us for selling or collecting. I still have a half dozen skulls somewhere in the garage. ). Mr Johns has a slogan on his profile "I am better than you" which, whether or not his tale of hoiked human bodyparts stashed in his garage is true, I think well sums up the selfish attitudes behind the people that strip historical sites for loose artefacts (or anything else) to add to their private collections for personal entertainment and profit. The Barlow Road runs through a National Forest. West of the Great Plains these are mostly lands reserved in the public domain by the U.S. government. In 1978, the entire Oregon Trail, including the Barlow Road, was named a National Historic Trail by the U.S. Congress. In 1992, the Barlow Road was placed on the National Register of Historic Places as a Historic District. So presumably, at the very least, ARPA applies here to any removal of historical material. Since the trail is a "leave no trace" area, I suppose hole-digging artefact hunters hoiking historical artefacts interpret that to mean "fill in your holes and stamp the divot down". What kind of protection is the US National Forestry Service providing to the historical resources of the land they manage if they are issuing permits to do this kind of thing? This is like England's "DEFRA" and their laissez faire Countryside Stewardship schemes financed by EU money. Guess they'll now be reduced to taking a leaf out of the US Professional Numismatists' book then and bring out the fart jokes. "Barford can’t get his facts right! It was found by a member of the public. [...] it’s anyone’s guess why Paul Barford can’t or won’t get his facts straight. On this form, God knows what credence anyone can now place on anything he writes". Really? Mr Howland is absolutely right not to simply take my word for anything, just as I'd urge everyone not take his. I'd prefer my readers to look for themselves, make their own minds up. This is why I'd like them trawling metal detecting forums and blogs, to see what they reveal about what metal detectorists actually do and say among themselves. It can be seen that Mr Howland is telling fibs in order to attempt to discredit me and counting on none of his readers bothering to check for themselves. It's clear to the rest of us that it was the Bosworth Boar which was discussed in this episode of "Britain's Secret Treasures" as "object number five" (and you can see that the programme skips over the fact that it was found as part of the archaeological project searching for the battlefield). The PAS record LEIC-A6C834 for this object states quite unequivocally "This badge appeared in the ITV1 Series 'Britain's Secret Treasures' on 22 July 2012". The object discussed in the programme is quite clearly not the "Chiddingly" badge. Mr Howland indulges in some name calling ("truth bender" and "boy blunder") because I do not accept that what we saw in the programme was not the Boar that he falsely claims it was. I ask those who took the trouble to check the link to decide for themselves who is bending the truth here. Which side is it that is trying to present and analyse the facts, and which side is trying to detract attention from the issues by inflammatory (and time-wasting) personal attacks just as Mr Howland is engaging in here? "the boar shown on the PAS website is not the same one as that found by Dr. Foard’s team (theirs came from the battlefield site!) The PAS boar was found at Chiddingly, Sussex, some 166 miles south of where the Battle of Bosworth took place! The PAS describe ‘their boar’ thus: ‘Boar Badge of Richard III from Chiddingly, Sussex. Featured at number 5 on Britain’s Secret Treasures’..,." It is also on their Flickr stream also alleged to be the BST boar number five. This false fact then misleads a member of the public rather badly, causing her to publish information in the "social media" placing the Battle of Bosworth in Sussex ! "Joanne • 34 weeks ago The Chiddingly Boar, medieval silver-gilt livery badge of Richard III, helped researchers pinpoint the location of the battle of Bosworth when is was found in east Sussex in 1999"
All I can say in reply to Howland's baseless allegations is that it is a fact that instead of the object he claims is shown and discussed, a moment's checking (which the metal detectorist trouble-maker could not be bothered to do) shows that on the actual programme a different boar is shown, and linked to a different site. So metal detectorist Howland is wrong. It also emerges from this that the Portable Antiquities Scheme apparently do not know if they are coming or going and have produced information which is misleading its partners and members of the public that pay for it and have a right to expect reliable factual information for their money. Using Mr Howland's arguments, perhaps we should be wary of believing anything the PAS say about anything? * The Chiddingly boar, found by Phil Weeden in 1999 seems not to be in the PAS database (at least there is no mention of it being there on the BM website, in 1999 the PAS did not cover Sussex - nota bene, though obviously I'd like to, I cannot actually check this tonight as the clunky old PAS database seems to be "down" again [still down Saturday]). Vignette: Metal detectorist tries to score a point. Fails. Focus on Metal Detecting: Can't use a Search Engine? Antiquities Minister Facing Criminal Charges"
and also for some reason imperiously demands an academic cv from me. One wonders what sort of person would raise such an issue without checking whether or not the allegation is true, the answer is just a mouse-click away. This blog is about portable antiquity issues and all three cases mentioned above are portable antiquity issues, so they are not only mentioned, but discussed in this blog. I really see no difference between artefact hunter doing something I consider dodgy with artefacts and archaeologists (like the Portable Antiquities Scheme) doing something I consider dodgy with artefacts and artefact hunters/collectors. Long-term readers (or those cleverer-that-the-average-detectorist who've worked out how the search engine works) will know that the first story to which the metal detectorist spitefully refers is already covered here on my blog: 'Macedonia's Kuzman Questioned', 'Update on Kuzman Case' - that was Wednesday, 17 July 2013. The facts discussed in the latter post seem not to have been taken on board by anti-archaeological detectorists (for whatever reason). I will update these posts when new information comes my way. The second topic was dealt with here: 'Bath archaeological thief caught after Bellarmine vase spotted on eBay', that was Thursday, 30 May 2013. I am not sure what "more" the detectorists want to hear. And the third... Detectorist Stout's link goes to a way-out-weird site containing New Age material called "Conscious Life News" and contains articles such as "Astronomical Crop Circle" and "Alien Intervention on Earth", "Extraterrestrial Mummy Found In Egypt – Fact or Faked? 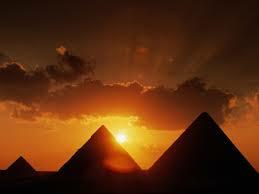 [video]" and what about..."Great Pyramid Starmap Etching Depicts Age of 9200 BCE"? The interest of New Agers in seeing Hawass harrassed and disgraced was (among other things) that he would not give them permission to tunnel under the Sphinx to get into the alleged Hall of records some Cayesian idjits believe is there (of course its not and the Sphinx has enough stability problems without allowing crackpots to tunnel under it). Zahi Hawass was accused by xenophobic US-hating opponents of organizing antiquity loans to the US for a travelling Tutankhamun exhibitions in the United States and Australia, Egypt’s ("the deal Hawass made allowed the transfer and display of 143 objects from the Egyptian Museum to Washington in 2003"). The case was thrown out, organizing such exhibitions promoting Egypt's culture abroad is what a Minister of Antiquities should be doing, no? Anyway, for what it is worth, this is what, for those that can use it, the search engine of this blog (up the top there) reveals is part of my account of the events: 'Hawass Apologises' Thursday, 22 September 2011; 'Former Minister Zahi Hawass Faces Charges Over US Museum Loans' and 'More Stolen Antiquities on Show in US' (both Monday, 2 April 2012); 'Egypt Court: US Exhibition Illegal' Saturday, 15 September 2012; 'Ex-Minister's Troubles Not Over', Wednesday, 30 January 2013, and "Zahi Hawass is Back" Friday, 7 June 2013. Again, I am not sure what "more" metal detectorist wants to hear from me. I expect he can follow the links I give and go off on his own to research the matter deeper if he wants. It is my observation that these people tend to want everything given on a plate to them by somebody else. They are seldom keen to put any of their own effort into things. This is well-illustrated by the above material, some bloke asserts that "Barford" has avoided talking about certain issues (because of an assumed pro-archaeological bias), but he has not bothered to take just five minutes to check whether or not in fact these subjects were omitted on this blog. If he'd done that, he'd have seen that the three topics he highlights have been discussed, in some detail even. The notion "check before you accuse" seems not to function in this milieu (see above the ridiculous tekkie kneejerk fiasco over the Bosworth Boar discussed in the post above this). All episodes like this do is to make the metal detecting community look totally inept, unable to focus and incapable of engagement in any serious heritage debate. "Egypt's unrest is a crisis for art:Is the world going to stand by and watch the destruction of Egyptian antiquities that are our global inheritance?" asks Jonathan Jones (Guardian, Tuesday 20 August 2013 - incidentally, with a link to this blog). British government travel advice is to avoid much of the country except for the Red Sea resorts. This development has been reported with no mention of culture as if the issue were purely about holidays. In fact, it reveals a crisis for art. [...] If the pyramids of Giza are not safe for tourists, how safe is the pharoah's solar boat, a wooden astral craft excavated next to the pyramids and displayed beside them? If holidaymakers are being told to avoid Cairo, is there a risk to the mesmerising, irreplaceable artefacts in its museum? [...] This is not speculation. It has been reported that a museum in Minya on the Upper Nile has already been looted in the current unrest. [...] The military-backed government may have its own reasons for promoting this story (it blames the Muslim Brotherhood) but photographs of the damage and theft make it clear something destructive has happened. [...] It is time for the Art Fund, the British Museum and any other body that takes responsibility for cultural heritage to speak up for the antiquities of Egypt. This is too important to wait until the worst happens. We can start by recognising that the pyramids and sarcophagi and statues of ancient Egypt are not just for tourists but part of a global inheritance, to be kept safe for all future generations. Yes, the British Museum, let it speak up against artefact hunters ripping objects out of the soil for collection and sale. With England's pro-artefact hunting Portable Antiquities Scheme an integral part of it, that would at best be hypocrisy. But yes, let them speak out and do what they can to help the beleagured Egyptian conservation services in this difficult task. And the US? SAFE is busily promoting its important 'Say Yes to Egypt' campaign, and is anything stirring in government circles? In antiquity dealers' associations? The grandly-named American Cultural Property Research Institute for example, what is it doing to help? The AIA? As preparations are underway for the second edition of a series that should never have been made in the first place ("we binned the proposal" the PAS are reported as saying), let us recall the way the first block of "Britain's Secret Treasures" misled the British public. The whole question of the background "partnership" of the PAS with artefact hunters in England and Wales was wholly skipped over. Anything the CBA was intending to say on the matter too was edited out (and in fact right after the CBA saw what was actually being put out on air issued an independent statement containing the sort of caveats which should have been in the broadcast). The PAS had thus skipped over their primary obligation to keep the public properly informed about portable antiquities issues. Then we have the matter of emphasising that the objects shown were all found by members of the "Great British Public", when some of them were not. The "Happisburgh handaxe" was only placed in the context which made it "Britain's number one object" by a multi-disciplinary scientific project, including excavation, a fact that was skipped over. The Bosworth Boar (object number five) again was not found accidentally by "a member of the public" but as part of a multi-disciplinary archaeological research. How many more of the "100 objects" were similarly misrepresented in the interests of the programme's fluff-propaganda for collecting is anyone's guess. But the crowning indignity is the faking of a viewer's' competition. Quite whose idea this was is unclear. Quite why nobody pointed out that such a competition was unworkable in the format of a brief week-long event is unclear. Quite who it was who, if it had been, decided to go ahead regardless is unknown. And why the professional archaeologists involved agreed to take part in the wilful misrepresentation of the truth in order to produce dumbed-down 'reality-show' entertainment is also not known. But I think we should be told. The reported results of the "submit your own Treasures" competition (in which viewers were to send in pictures (only) of what they'd themselves found and was not reported) were thought-provoking. Of course we have no way of knowing now whether what was reported was in fact the truth (see below). The presenters claimed on air at the end of episode 6 that the 'competition' had produced over 1000 new reported "treasures", including archaeological material. The metal detectorists had no doubt been anxious to show their prowess and get their names up on screen. The submissions to the competition ended on the Thursday. We were shown a sequence with the team of experts picking through the entries, apparently that afternoon. It was a bit unfortunate for this charade that one of the people supposedly in the panel on that day was in fact at the other side of the country tweeting his presence at a Welsh conference and cannot have been in two places at once on the Thursday looking through 1000 objects and discussing them with other panel members. Then a member of the BM/PAS team was sent out to the site of the discovery (which would have been Friday or Saturday in order to edit the film into Sunday's programme). In the film, the sky is blue, yet on both Friday and Saturday there was no sun and it was cloudy in the region and raining further west. The evidence shows, despite what viewers were told by the archaeologists, that this film had been made before the "selection" of this "object submitted to the competition". It was all a big sham presented as state-of-the-art instant TV. The chosen object was a metal model book which Roger Bland narrativised by imaginitively linking it (for what reason is not stated) with some important medieval pilgrimage route running through the middle of this Derbyshire barleyfield. The real scandal is that this object, chosen as the winner of the viewers' competition, not only was not found in 2012, but long before, in 1997, and was already in the PAS database. It had been there since Wednesday 15th November 2000: HAMP527. The PAS lent their name to a fiddled competition by choosing an old object from their own database and cynically deceived the public into believing it was a previously unreported find (surely the PAS is encouraging people to use the database, not hoping they will not so their lie would not be detected). Quite why the PAS (and the Director of the CBA) felt they had to engage in this unprofessional deceit is anyone's guess. Time Running Out for No-Questions-Asked Collecting? I’d say about 30 to 40 per cent of the items floating around on the international art market are fakes. It’s a really big problem. (Interview by Amy Rose Dawson, Metro, 28 Aug 2013)so, obviously in this market too, it's important to know where the object was in the past and how it entered the market. "curiously silent about Dr. Foard’s co-operation with detectorists, though highly vocal and insulting to amateur [searcher]s doing the same thing elsewhere! I wonder why?" He may well wonder. If he persists in thinking that the problem is the tool, and not what it is used for, then he'll never get it. I have long argued that the use of the anorakish term "metal detecting" is cognitively damaging, and we need to call a spade a spade and agree that the problem is not metal detector use (for they can be used to seek yesterday's lost change on beaches, smuggled sharp things at airports, or gold and meteorites in the US desert well away from historic sites). It is one of the myths fostered by artefact hunters that they should all be considered good guys really because they can and will help in archaeological projects when asked. Frankly, there is not the slightest connection between this and their hoiking of artefacts for personal entertainment and profit when they are not helping in a survey. This is a wholly red herring argument, but one the PAS all-too-willingly highlights in its pro-collecting propaganda. The people taking part in this survey did so on the basis of a contract and they were paid. In other words they were at the time part of the archaeological project,. So much so that when one found a silver badge (The Bosworth Boar), they did not get a Treasure reward, as archaeologists are not eligible. (Its inclusion as object number 5 in the PAS pro-tekkie propaganda programme "Britain's Secret treasures" is another manipulation of the truth, it was not "found by a member of the public" but by a professional archaeological team). But there are two other issues here well worth mentioning, now it has been brought up by the detectorists. The first the obvious one. The moment the news broke, nearly every news item ended with something about keeping the site's location secret to prevent artefact hunters removing stuff from the site before the archaeological project finished ("in order to spare it the attentions of amateur treasure hunters"/ "The exact location has been kept a secret to prevent treasure hunters from plundering the area" / "but the exact location was kept a secret until now to protect it from treasure hunters"). It is quite clear that it is no longer the case that "illegal treasure hunters/metal detectorists" are seen as the sole problem for the integrity of an archaeological site. The second point is far more interesting. We are told by their supporters that artefact hunters allegedly hunt (allegedly because I do not think this is wholly true) in "areas archaeologists would never go" and therefore they "find new sites" for archaeologists. They allegedly "report their historically significant finds" and they also "research" their area to find spots to search. If all this was true, we would not have to wait until an archaeological project was set up in March 2009 to search some fields which documentary research suggested could have been the real site of the battle. Metal detecting has been going on in the UK since the early 1970s. For 35 years no metal detectorist found the surface evidence of the site of the Battle of Bosworth, even though the site is strewn with metal objects. How can this be, if all the detectorists and their supporters claim is true? They cannot recognize fragments of arms and armour from the 1480s? This map is a portion of the map of PAS records up to, so in the period preceding and including the four year archaeological project which in the end located the battlefield. The projection of the four red marks in the margin cross at the battlefield site. It is clear that the battlefield in the years preceding the project is right in a thick concentration of dots. They in turn are the result of two factors, metal detecting/finding has been taking place in the area at some intensity and the finders have been reporting some of their finds with an intensity greater than the areas around. Yet, still the battlefield was not identified. Why? My suggestion is that this is one more actual situation which indicates that the junk arguments produced by the artefact hunters and their supportive 'partners' are simply just that, junk arguments based largely on wishful thinking and anecdotal evidence, but not supported by any real evidence. Finally, here's the sad thing. The metal detector survey was only a few seasons. They used discrimination, rejecting all 'iron' signals. There is probably a lot of stuff still in those fields and the areas around. Some more boar badges and other ornaments, many more of those highly important early cannon balls. All of which, properly plotted in detail considerably more than a six-figure or eight-figure NGR would add to that dot distribution map, could be interpreted by the techniques of battlefield archaeology. Unfortunately it's not going to be. What's almost certainly happening is that on certain moonless nights cars are drawing up in the dusk, parking a little way beyond the site and dark-clad tekkies are sneaking out eager to get themselves some 1480s militaria for their collection, a cannon ball or two a spur maybe, to take away and dream. Never mind the fact that the study of the site has only just begun. And of course most battlefields are topsoil evidence only, it's all in the ploughsoil, in this case where it has been since August 1485. 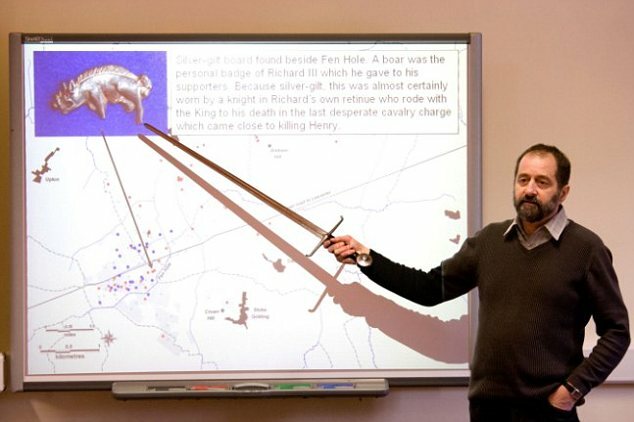 "We used archaeology to solve the Bosworth problem"
Note that the metal detectorists who raised this topic, instead of addressing the points made here in this post, in a tacit acknowledgement of their validity are desperately trying to deflect attention to one object found, the "Bosworth Boar" and my alleged muddling of it with another one. This is the typical tactic of portable antiquity collectors in general. In the US, the BLM is seeking information from metal detectorists wanting to help individuals damaging archaeological evidence along the Oregon Trail near Burley in south-central Idaho. These people used metal detectors and shovels to illegally search for artifacts, federal officials said. Bureau of Land Management officials are in disbelief after a massive amount of damage to BLM property. The BLM is investigating ripped up trail heads at the Oregon Trail near Burley. Archaeologists describe it as one of the worst cases of damage to historical public land in their careers. "So about six weeks ago our Burley field Office archaeologist was out near the Milner Historic Recreation area. She was with a group of volunteers and they were out doing trail work when they discovered a hole and then another hole," said Heather Tiel-Nelson with the Bureau of Land Management. In total three hundred and sixy holes had been dug along the historic Oregon Trail. "We assume that what happened is someone used a metal detector to discover where the artifacts were along this section of the Oregon Trail," said Nelson. Artifacts and gold coins can be worth major cash. [...] The BLM is hoping that education and awareness will prevent more damage from occurring at historical sites. 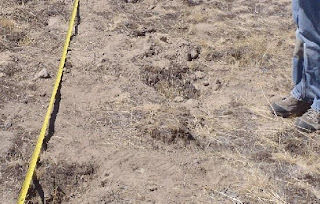 Bureau of Land Management officials said they recently found about 400 holes over several miles of the trail, which is listed on the National Register of Historic Places and protected under the Archaeological Resource Protection Act of 1979. 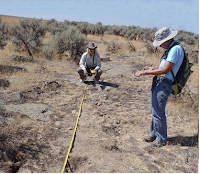 The holes are along wagon ruts made in the 1800s through the dirt and sagebrush by thousands of immigrants heading to Oregon, officials said.[...] BLM Burley Field Office Archaeologist Suzann Henrikson. "The recent damage to the trail near Burley has resulted in a significant loss of history for the American public". We will see if law-abiding metal detectorists give the authorities any tips. 400 artefacts do not just disappear. People with metal detectors likely visited the site in hopes of finding valuable artifacts. Henrikson has been expecting something like this to happen for a while, in part because of two TV shows. One on the cable channel Spike TV originally called "American Digger", now "Savage Family Diggers", features a former pro wrestler and a lot of explosions. It’s about people who go out with metal detectors, find and dig up historic artifacts and sell them. The National Geographic Channel has a less intense version called "Diggers". "H.V., baby", measured in dollars and cents. 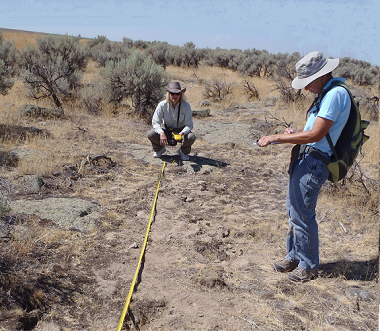 Adam Cotterell, 'Treasure Hunters Destroy Idaho’s Historic Oregon Trail Ruts' Wed August 28, 2013. Just for the record, because some artefact hunting metal detectorist is writing otherwise, the news items came to me from two separate Google alerts and then somebody in the States sent me a link to one of the articles asking whether I'd seen it, as did Heritage Action. 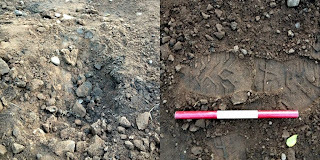 So I decided to put together a post, then saw on a blog that artefact hunters were refusing to accept that these little holes were the work of people hunting for artefacts which seemed a bit ridiculous to me, thus I wrote the post which is below this one. When is an artefact hunter not an artefact hunter? Vignette: The thieving bastards filled in their holes and took their trash home but that is not the problem with what they've done here. "Why heck", says Farmhand Clem, hitching his thumbs behind the straps of his dungarees, "I've sin this all before", he says, spitting. "Those dangfool iv'ry tower academicks, they don' know nuffin' ! They'm not metal detecting holes, they'm gopher holes!" "While it may well be true that detectorists were responsible for this damage, my question is WHO made this determination, and how can they know that “hundreds” of artifacts were taken? Call me a ”doubting Thomas” but I am just a little suspicious of how the original AP article is worded, and how it gained so much traction. Maybe it’s because I’ve seen this type of thing so many times in the past. Look for conservationists to have a field day with this one. Another “negative” for their files. Of course Buckwheat Brad cannot get it into his head it's not about the artefacts being found and taken, but the holes being dug into the archaeological record. So have a look at the holes yourself, what do you think, unscrupulous metal detectorists targeting signals or random gophers digging vertically in the dust and then filling the holes in? Then have another look at Clem and Buck's discourse, is there a single sign there that they are at all shocked or dismayed about the destruction of historical evidence? Is there the slightest indication that they vehemently hope these people will be caught and made to accept responsibility for what they did/have done? That they'd like their fellows to help catch them? Well, heck, no. All they are worried about is that somebody will "see" this story and use it to point out that artefact hunting does damage sites. The director of a German auction house has been arrested in connection with the theft of rare and antique books from a 16th century library in Italy (Head of German auction house arrested over theft of Italian antique books telegraph, paywall). In a statement, the Zisska & Schauer auction house in Munich described allegations that its executive director had received stolen books as “preposterous, absurd and totally groundless”. The library's director Marino Massimo de Caro was jailed for seven years in March. Stolen books from the collection have been found in Munich, London, New York and Tokyo. This case suggests dealers buying stolen dugup artefacts coming from abroad may yet feel the cold grasp of the law on their collar. Fifty thousand (we are told) collectors of dugup ancient coins in the US are represented by a group calling itself the "Ancient Coin Collectors' Guild". This group seems in fact to represent more the interests of the no-questions-asked coin TRADE than those of ethical collectors. This group in order to promote unrestricted import of dugup coins regardless of origins has been actively trying to persuade the world (and in particular their Department of State) that dealers deal and collectors collect this material (no-questions-asked), not for personal reasons, fun or profit, but for altruistic independent scholarly endeavour (coin dealers label themselves "professional numismatists" for example). It is however abundantly clear from the forums, where one can see at first hand these collectors and dealers discussing what they actually do, that this is a self-serving simplification of a much wider spectrum of activity, and in fact this scholarly endeavour is very much a minor fringe activity among a greater mass of people collecting these objects for other reasons. The dealers claim that their brand of numismatics (here treated as something one can do with 'data' in the form of a heap of decontextualised coins on a table rather than those individually linked with a known collecting history) is a discrete discipline. Moreover it is one, they claim, with a nobler tradition than younger ones (here they compare it to archaeology). For it however to be regarded by the rest of the academic world as a discrete discipline, it has to be based on some kind of a methodology. The professional numismatists practising "heap of coins on a tabletop numismatics" however have time and time again showed that they are at a loss to produce even a simple handlist of texts setting out even the basics of such a methodology. As far as I know, the collectors and dealers gathered under the ACCG umbrella have not yet hit upon the idea of collecting such a reading list for the benefit of guild members, and others that would like to see what they claim to be doing with all those millions of decontextualised pieces of archaeological evidence, still less write a textbook of their own. A few days ago one dealer produced a list of works which he claimed fulfilled this task, but it consisted mainly of catalogues rather than any exposition of method or theory and examples of their application. When I pointed this out, he retaliated in the only manner it seems that collectors of all types can imagine. Name-calling and insult. It beats me why these people behave like this. You can see that they all desperately want to be treated seriously, as equal partners in the heritage debate. That would be fine if they were capable of behaving in such a way. that includes having something substantive to say, rather than their habit of trying to refer to self-created and unsubstantiated myths. The proper response in any debate, including this one, to "but that was not what I meant at all" surely is "sorry, I misunderstood, this time I asked a mate to help me, here is the list you asked for" and not a stream of abuse and ad personam attacks. It seems to me that only a complete lunatic would see that as the way to convince anyone of the validity of their arguments. In the past few days, I have posted up some links on my own blog to texts on the methodology of numismatics, but one that on the whole pays attention to all the attributes of ancient coins as data, that is examining them in relationship to their findspot context, rather than just the comparative study of the pictures, writing and physical mass of the decontextualised object in bulk lots. Be it noted that there are no corresponding posts on related subjects on the blogs of any ACCG members. All they can do is sling mud and hurl insults. Very 'scholarly'. I know the Department of State is watching this and drawing, I hope, conclusions and passing them on to the CPAC. The ACCG' fave metal detectorist pals have graduated to toilet jokes now, I bet US reputable fart-joke coin dealers ("Ancient Coins" blog) and their metal-detectorist-cuddling lobbyists just cannot wait to "wade in" eh? "Plünderungen an ägyptischen Kulturstätten - Eine Chronologie seit dem 14. August 2013 Ein Gastbeitrag von Jutta Zerres (Eingestellt von Rainer Schreg, Montag, 26 August 2013). Sectarian Attacks: An Interactive Database Based on the database of sectarian attacks initially launched on Nile Revolt, we have now upgraded the original database to an interactive database available for all users. On the "Egypt's Heritage Task Force" facebook page there is now a gallery of quite distressing photos The First Operations of Salvaging Mallawi Museum showing the beginning of cleanup operations, Monica Hanna and others can be seen in action. Will the Getty have to return Fano "Victorious Youth”? The question is not whether the Bronze was illicit when the Getty trustees made the decision to acquire it. It most certainly was, and still is. The question now is whether the Getty will be able to continue to retain possession. In the press and in cultural property circles the Bronze is considered nearly un-repatriatable given this convoluted history [they can't touch you for it - PMB]. But an Italian forfeiture action in Pesaro has quietly set in motion a means by which Italy can reclaim the Bronze through a Mutual Legal Assistance Treaty. This transnational forfeiture marks the creation of a useful new tool in the struggle to repatriate looted and stolen cultural objects. And perhaps more importantly the dispute signals a continuing trend in the importance of domestic law in source nations in cultural heritage law. While on routine inspection at Mit-Rahina, the Tourism and Antiquities Police uncovered on Tuesday a plastic bag concealing Ancient Egyptian artefacts. 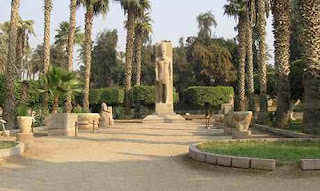 The bag was found half-buried in the botanical area behind the Hathor Temple archaeological site, located 24 km south of Cairo. Minister of State for Antiquities (MSA) Mohamed Ibrahim told Ahram Online that the bag contains seven objects, three of which were reported missing from the Mit-Rahina gallery during the violence that erupted in the aftermath of the January 2011 Revolution. The other four items, he said, resulted from illegal excavation in the site. Adel Hussein, head of the MSA's Ancient Egyptian Archaeological Section, explains that the three previously missing objects include a partly-damaged clay plate, a red clay pot and an alabaster cylindrical pot with a round base. The other four objects are also clay pots of different shapes, colours and sizes. A Panel created by the National Gallery of Australia to investigate works bought from accused smuggling mastermind Subhash Kapoor has never met despite being established almost a year ago. [...] All of the antiquities were bought with public funds or funds donated in exchange for tax breaks. With a flood of newly looted antiquities appearing in the market place from conflict zones in Afghanistan, Egypt, Iraq and Syria, as well as antiquities stolen from places such as Cambodia, India, Laos, Myanmar, Nepal and Vietnam, those seeking to purchase "untainted" cultural objects face a formidable task. It is to be hoped that our leading public institutions, such as the NGA, will in the future set a much higher benchmark than they appear to have done in the past when evaluating the legitimacy of objects being brought into their collections. Nevine El-Aref, 'Mallawi Museum gold coins recovered', Al-Ahram Monday 26 Aug 2013. Ahmed Sharaf, head of the museum section at the MSA explained that the coins all depict the features of a Roman emperor called Valdese in his battle suit, left hand clutching a bunch of flowers while the right one holds a cross. Valdese the Flower Power Emperor. Or would that be Valentinian and Restitutor Reipublicae and a labarum and Victory? There is a group of over seventy such coins in the list of items missing (page 193 onwards) presumably they were kept together. There were some 166 gold coins stolen in the raid. Where are the rest? The official list of objects missing from Mallawi Museum has been released, at the moment only in Arabic, so that dealers and collectors offered any items looking like this can report their suspicions immediately to the authorities and the suspects investigated. That this list was prepared so quickly owes much to the fact that the museum seems to have their records in good order, and in no small measure, it seems, the energy of Monica Hama in mobilising efforts. Rick St Hilaire, 'Chicago Museums Seek Summary Judgment in Rubin v. Iran', Cultural Heritage Lawyer Rick St. Hilaire blog, August 26, 2013. The Field Museum of Natural History and the University of Chicago's Oriental Institute filed a motion for summary judgment last week seeking to end a case that has pitted victims of a terrorist attack against two Illinois museums and Iran. For a summary of the beginnings of this case, in a September 1997 event in Jerusalem, see here: Jenny Rubin, et al v. the Islamic Republic of Iran. Readers might remember the "responsible British detectorist" who could not make up his mind whether his name was "Don" or "Ton" and who falsely asserted an "endemic ransack of huge numbers of Roman coins that are ending up on Ebay" from Poland. He has just sent a comment to the thread on detectorist Graham Chetwynd's promise to come over here as an ambassador of the hobby and have a proper discussion of the issues. I am not publishing the comment. Apart from its other insulting remarks addressed to my person, it contained a joke on the subject of Syrian chemical weapons which I think many besides myself would find highly offensive. I have not posted it, but you will have to take my word for it that there are people in UK metal detecting who find such things as nerve gas attacks on unarmed brown-skinned civilians intensely amusing. You do not have to look very far on their forums for all manner of misogynous, sexist, xenophobic and racist comments and 'jokes'. Jamal Shahid, 'Smugglers fly out but without treasures', Dawn.com, 26th August 2013. Security personnel at the Islamabad airport busted a third attempt in almost as many months to smuggle out rare artifacts of the country on the Independence Day, Dawn has learned. Customs sources said Bangkok-bound passengers Subhan Allah and Zahir Allah set off the metal detector alarm while passing through the screening machine. Their body check yielded the airport security staff two envelopes containing ancient gold coins. Since the two ‘smugglers’ from Peshawar could not be detained legally, they were allowed to board their Flight TG 350 – but without their treasure. The haul was twenty gold Kushan coins and a Hellenistic style gold pendant. Senior Customs official at the Islamabad Airport, Ghulam Ali Malik, explained that whenever a catch is made of the August 14 kind, a case is registered under the Customs laws and the Antiquities Act after the verification of the confiscated artifacts. “We know that smugglers often carry to Thailand antiquities, such as these coins, the export of which is banned. They conceal them in decoration pieces but the bolder ones try to carry the treasures on their persons. We are not permitted to allow the carrier board the aircraft with items which appear important historical riches,” he said. I'd say not let them on the aircraft at all, but lock them up and find out where they got the coins from and send someone there to arrest the middleman. Then find out who are their contacts in Bangkok and get the local authorities to investigate them (and where do they go from there?). What's the problem? How is anyone going to combat artefact smuggling and looting otherwise? Vignette: Where were the envelopes? UK Metal Detecting's Ambassador to Europe ? Egypt: When was Mallawi Museum Looted? SAFE: "Say YES to Egypt's Heritage"
De Asse: "The First Numismatic Textbook"